It’s daybreak Saturday—you scramble for your clothes and caffeine, load up your gear and trusty pup, and drive the dirt backroads to your favorite mountain trailhead. When Monday rolls around, you load up the kids, turn on the heated seats and Apple CarPlay, activate the adaptive cruise control system in traffic, drop the kids at school, unload a bunch of stuff at your parents’ place, and finally navigate the narrow, low-ceilinged confines of the parking structure at work. These are the varied tasks that the versatile 2018 Subaru Outback was designed to handle – thanks to its generous amount of passenger and cargo room, plentiful technology, all-wheel drive, and high ground clearance. 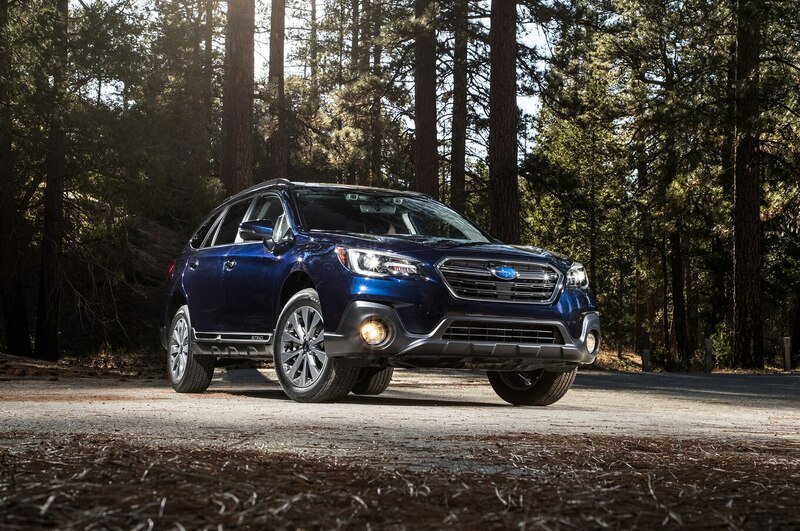 This successful product-planning algebra made the Outback was Subaru’s best-seller for 2017, topping the Forester. What else makes this popular wagon-like crossover so appealing and how does the optional flat-six engine perform versus the standard flat-four? 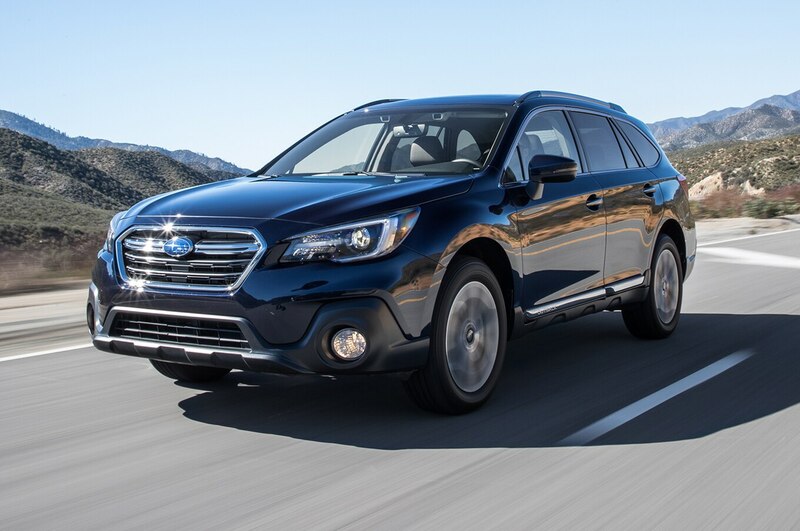 Keeping the Outback fresh, Subaru updated the 2018 model with a revised grille, front bumper, headlights, and front body cladding. Subaru also reworked the chassis and suspension, and retuned the brakes and power steering in order to improve the driving experience. However, the 2018 Outback still rides on the same platform, not the new Subaru Global Platform that underpins the new Impreza, Crosstrek, and the three-row Ascent. Inside, the center console and steering wheel have been restyled and there is new contrast stitching. On the tech side, the 2018 Outback’s updated infotainment system adds two additional USB ports for the rear passengers (standard on both 3.6R trims), a larger standard 6.5-inch system for the base 2.5i trim (up from 6.2 inches), an improved voice recognition system, and many additional Starlink apps including Best Parking, eventseeker, Yelp, and eBird, an app that advises local bird sightings and locations. Until the Ascent arrives this summer, the Outback sits at the top of Subaru’s crossover lineup. Our Outback 3.6R tester came equipped with the optional 3.6-liter flat-six engine that delivers 256 hp and 247 lb-ft of torque, a nice power bump from the standard 175-hp, 174 lb-ft 2.5-liter flat-four engine found in the 2.5i trims. A CVT is the only available transmission. When tested on the track, the flat-six Outback sprinted to 60 mph in 6.9 seconds, a significant 2.5 seconds quicker than the flat-four’s time of 9.4 seconds. You’ll feel the difference on the on-ramp, trust us. The 2018 Outback was also 0.4 seconds faster than the 2015 Outback 3.6R model we tested. Both four- and six-cylinder models braked almost identically, 126 feet and 125 feet, respectively. The four-cylinder, of course, wins in the fuel economy category: the six-cylinder delivers an EPA-rated 20/27 mpg city/highway versus the four-cylinder’s much better 25/32 mpg. Based on 45 percent highway and 55 percent city driving, the 2.5i has a total driving range of 518 miles, much longer than the 3.6R’s 407-mile driving range. If you don’t need quick acceleration, the Outback 2.5i will save money on gas and you’ll go to the pump less. On the fuel economy front, the Outback ties the Jeep Cherokee with the standard four-wheel-drive system (20/27 mpg), but when equipped with the more advanced Active Drive II system, the Jeep’s rating drops to 18/26 mpg. The Regal TourX is the most efficient of the three, delivering 21/29 mpg. 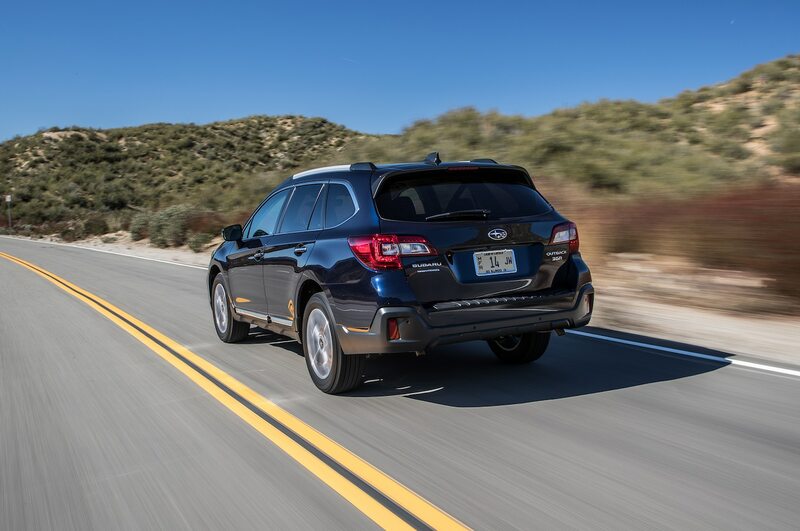 However, thanks to the large 18.5-gallon fuel tank, the Outback 3.6R’s 407-mile driving range beats the Regal TourX’s 343-mile range and the Cherokee 3.2’s 332-363-mile driving range. Once Subaru replaces the aged flat-six with what will likely be a 2.0- or 2.4-liter turbo-four engine, expect fuel economy to improve. The Outback offers slightly more cargo space than the all-wheel-drive Regal wagon with the seats up, at 35.5 cubic feet versus the Buick’s 32.7 cubic feet. With the rear seats down, the Regal’s 73.5 cubic feet of maximum cargo room is practically even with the Outback’s 73.3 cubic feet. Safety is one area where the Outback excels. Not only did the 2018 Outback receive the highest five-star overall safety rating from the NHTSA, the IIHS considers it a 2018 Top Safety Pick+, its highest designation. Getting the Top Safety Pick+ rating is not easy, but the Outback did it by getting the highest rating of Good in all six crash tests and in the headlights evaluation, and for getting the highest rating of Superior in the front crash prevention evaluation by avoiding 12- and 25-mph collisions thanks to the optional EyeSight package of driver assist safety features. EyeSight is available on the 3.6R Limited trim and standard on the Touring and includes adaptive cruise control with stop and go capability, automatic emergency braking, lane departure warning with lane keep assist, and high beam assist. Other driver assist safety features include reverse automatic braking, blind-spot monitoring with lane change assist and rear-cross traffic alert, steering-responsive LED headlights, and Starlink Safety and Security connected services (automatic collision notification, SOS emergency assistance, and more). On the road, the 2018 Outback 3.6R’s ride is comfortable, the cabin is quiet, the rear seats are spacious, and the power from the flat-six is abundant. 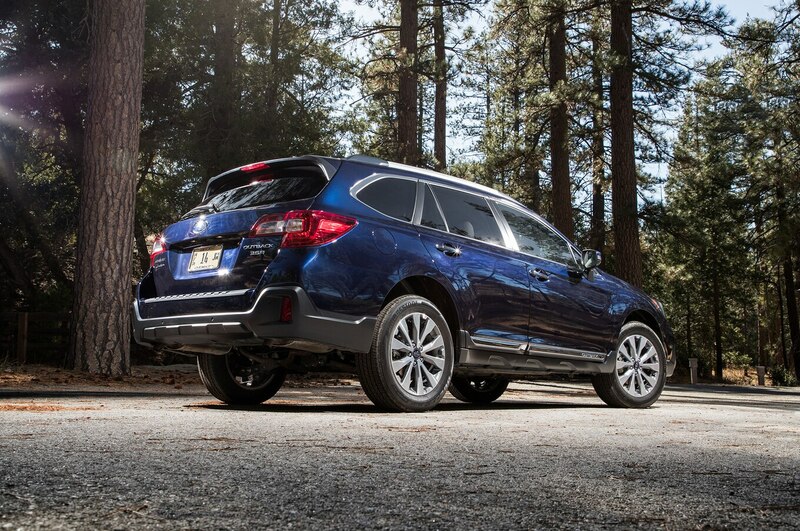 The CVT helps make the most of the flat-six engine, and the Outback’s powertrain is very responsive—maybe too responsive—forcing the driver to slowly apply throttle from a stop or be met with a quick jerk. Associate editor Scott Evans agreed, “At every stoplight and stop sign, there’s a jerk when you step on the gas, as if the belt in the transmission has gone slack and is suddenly pulled taut again,” he said. “Once rolling, at least, all is well.” Handling is competent but not one of the Outback’s strengths, like most significantly raised vehicles. The seating position is high and outward visibility is good. “Fantastic outward visibility, a Subaru strength,” Evans said. “Big windows and low beltlines make it easy to see out of and minimize blind spots,” he continued. However, more than one editor commented that the front seats, while comfortable, feel flat and do not hold you in place well. As for interior amenities, our loaded Touring trim offered a luxurious look thanks to the contrast-stitched brown leather covering the seats and door panels, the leather-wrapped and heated steering wheel, silver metallic and wood grain interior trim, reclining and heated rear seats with air vents and USB ports, an upgraded 12-speaker audio system, and the large and impressive looking 8.0-inch multimedia touchscreen with a navigation system, Apple CarPlay, and Android Auto. “They’ve really gone upscale with the interior to justify the price tag,” Evans said. 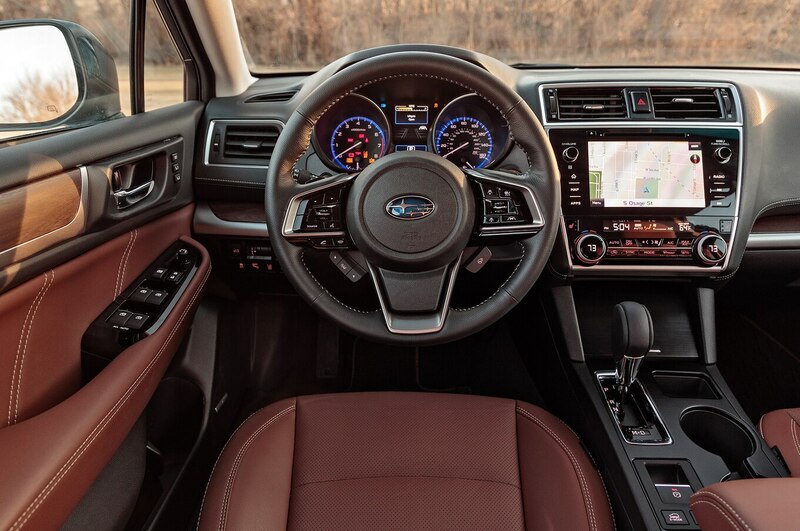 “The design is still pretty conservative, but the stitched leather looks excellent and the fake wood is passable.” Evans and I also loved the Subaru’s latest Starlink multimedia system, “Subaru has finally got its infotainment system sorted out. It’s clean, intuitive, and easy to read. Well done,” he said. Our 2018 Subaru Outback 3.6R Touring tester came standard with Subaru’s symmetrical all-wheel-drive system with torque vectoring, an X-mode off-road mode with hill-decent control, 18-inch dark gray wheels, the EyeSight suite of driver assist safety features, reverse automatic braking, a power moonroof, steering-responsive LED headlights, heated front and rear seats, 10-way power driver’s seat (four-way power for passenger), Java Brown perforated leather-trimmed upholstery with Ivory stitching, a 12-speaker Harman Kardon audio system, four USB ports, and the Starlink 8.0-inch navigation multimedia system. With no available packages on the Touring trim and no accessories added, the price tag comes out to $39,605. It’s an easy call to recommend the Outback to someone looking for a multipurpose, comfortable, safe, and spacious vehicle. The flat-six paired with the CVT might not be the quickest in the segment or the most fuel efficient, but it provides good and responsive naturally aspirated power—in a world of turbocharged engines, that’s refreshing. Features editor Christian Seabaugh summed up the Outback well: “I think the single best thing about the Outback is its versatility; it’s just so good at so much. It’s as comfortable exploring national park trails as it is doing daily driver duties.” Once built on Subaru’s new platform, the Outback should get even better. We’ll give you an update once that one arrives. Although the Outback is getting on in years since its origination, when most Americans think of a rugged, lifted wagon, the tried and true Subaru should come to mind.